Now that I've found the limits on pandora.com ("we are unable to let you skip any more songs this month due to licensing agreements." Huh!?!?!) I have time to post other business. Here's some pics from the premiere of Monkey Warfare at Empire cinemas in Vancouver, handed over by Ifny but shot by David Repa. This is Ifny of Pedal Revolutionaries (who has just posted her podcast of the MONKEY WARFARE INTERVIEW), Alan MacInnes of Discorder's Cinema Aspirant, Reg Harkema, the director, and me, Flick Harrison. Days go by and blogging gets harder (especially with the nagging doubt that blogging is actually lame). Both Vancouver Film Fest screenings of Monkey Warfare were packed to the gills. I notice the Vancouver audience had a good laugh at all the drug humour; in Toronto that stuff caused chuckles but out here people were laughing out loud. Now I don't feel like the only one who got it. Reg actually intro'd the film by saying that despite all the Toronto references, it is actually an East Van film: that's where Reg is from. So I had a blast projecting visuals at the Vancouver International Film Festival opening gala. The party was at the Crowne Plaza Hotel Georgia in the main ballroom. 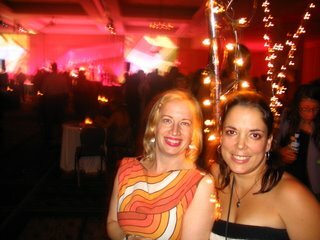 This picture is Cathy Falkner with Sandy Buck. Sandy planned the whole event which is an insanely big job. Cathy was helping do the decoration on the night. In the background you can see my visuals! They were on two giant odd-shaped fabric backdrops on either side of the band, plus one little projection on the escalator outside the ballroom. It was fantabulous, in my opinion. So Monkey Warfare is showing at Vancouver International Film Fest on Sept 30 and Oct 1! Details here at VIFF's page. Also, there's a new Monkey Warfare official website. Yay for top-level domain names! The page automatically plays the awesome Weird War song that usually runs through my head about six-seven hours per day now. And finally, Monkey Warfare got a Special Jury Award at the Toronto International Film Festival 2006! Apparently the jury didn't stay through the credits. Heh heh heh. So they missed the best part. "Harkema, a B.C. 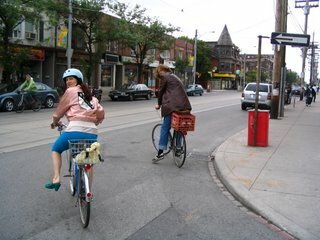 native, said afterwards: "Gee, I guess I'm not gonna buy that huge hunk of hash [hashish] I was dreaming about," - an echo of director Bruce McDonald's statement that "$25,000 is going to buy me a chunk of hash," when his feature Roadkill took the Toronto-City prize in 1989." I love that they had to explain that hash is hashish. Really? Ya don't say! Another low-key day except for the super second screening of Monkey Warfare. 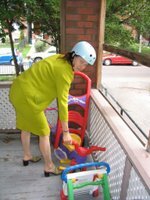 Here's Cindy getting set to ride her little bike to the festival. She has fabulous outifts, n'est-ce pas? This is an opportunity to point out that not only is she IN Monkey Warfare, she also has a band called The Tennessee Twin. I have broken my Toronto Film Fest cherry this week as I finally walked through the hallowed, CN-Tower-shaded portal and into TIFF. Riding the wave of this year's buzz-film, Monkey Warfare, is the best way to see the fest. I was the assistant editor on MW and had the infamous minor role as an instructional-video host on the safe construction of Molotov Cocktails. Get your tickets early, it looks to be a sellout show. 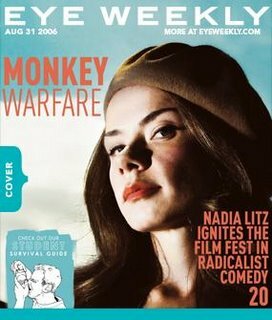 Nadia was on the cover of Eye Weekly, which, no doubt, will make the show a main event. I'll be hosting the after party on Sunday night, most likely in my pidgin french! The Eye called my scene "potentially irresponsible but hilariously fitting." Yeehaw! In other news, it looks like Monkey Warfare will also be showing in Vancouver at the VIFF! Triumph and Tragedy for Monkey Warfare, Reg Harkema's new urban-geurilla comedy starring Don McKellar. For some reason, the lawyers finally nixed my scene (see video below) from the film, in which I (in french) explain how to safely make a molotov cocktail so y'all won't blow yerself up. Don't worry, you don't need to know french to get it. Hey, it's fiction, right? Remember "The Great Train Robbery," an early silent that was nearly banned for showing, in full detail, how to rob a train? Monkey Warfare got into the Toronto International Film Festival, but it's unclear whether my scene will show, even at festivals. Make sure to add "monkey warfare" as a myspace friend! So I just finished working on Monkey Warfare, Reginald Harkema's new film starring Don McKellar! I will play a small part after the closing credits - a surprise safety video, if you will, in the context of urban guerillaism. The hint is that my script came from Steal This Book by Abbie Hoffman.